What does "open government" have to do with democracy? Since the President of the Treasury Board, the Honourable Scott Brison, announced plans to move forward on "open government," we have been trying to best understand what "open government" means and how it affects citizens' relationship with government. Kent Aitken, who works on open government for the Government of Canada, had provided this primer on the Canadian Public Service Renewal blog. These views are his alone and do not represent the organization. I've probably answered that question - What is open government? - a thousand times in the last couple years. With varying degrees of clarity and convincingness. This is an attempt at a more universal, albeit less concise, version. It's an occasionally murky concept, and gets defined differently in different countries, by different people. 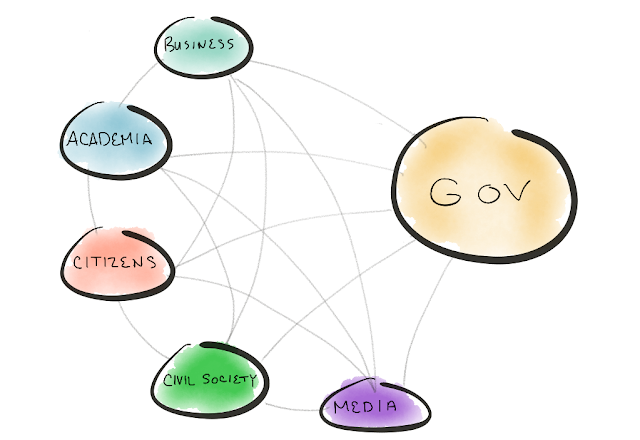 My go-to today might be something like this: open government is a commitment to making data and information about government operations and decisions open to citizens, and creating opportunities for people to engage in public decisions that interest or impact them. 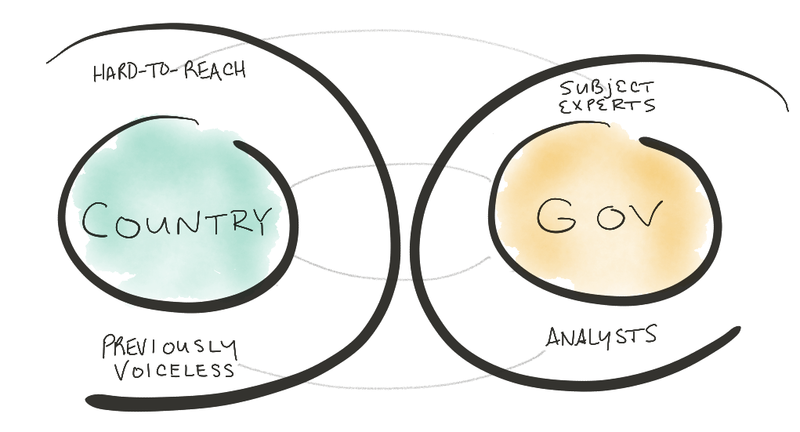 But that still doesn't really connect the dots between the ideas that make up open government, so I'm proposing another lens. 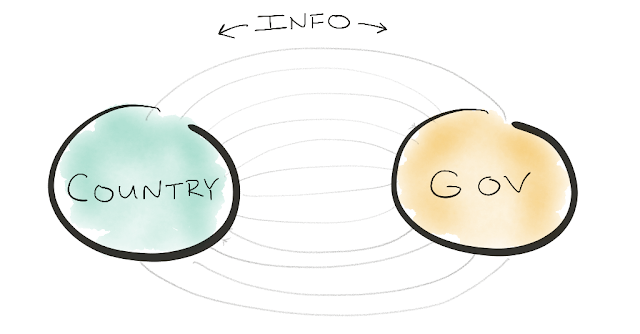 Let's think about information flows between government and stakeholders. Actually, that's a bit unwieldy. Let's collapse the left side into a simpler ecosystem, while recognizing that there's a lot going on in there. There have always been information flows. There was never a point where government was completely closed then suddenly became open. In the 1800s, Canada conducted the census to get information from Canadians, created awareness campaigns to encourage people to move west, kept parliamentary records in Hansard, and published changes to laws in the Canada Gazette. None of which we'd consider "open government" today. But it's part of the ecosystem of information flows on which we're building. Since the digital age, governments have provided far more information about programs, policies, and services. This could be web content, emails, or publications. However, the ability for digital communication also created demand, so governments have started releasing the raw data behind research and statements, collecting more public feedback on policy, and posting documents for the sake of transparency, like expense reports. However, while there are new formats and documents to release, there are also just fundamentally different types of information. For example, consider data on water levels and invasive aquatic species, the first line in the following diagram. It's been available to citizens for a few years. But, while people outside government can use that data, more people can use that data better with a few other links made between country and government. In this case, a group called Aquahacking was able to express their needs to government (Environment and Climate Change Canada), who showed up to present and provide context and clarifying information about how the data was collected. To close the loop, the Water Rangers system can now provide reliable measurements back into the data collection process, by enabling kayakers and beach-goers to do citizen science. There have always been information flows. Open government is about adding more flows, to more people, in more ways that are more appropriate to needs (see: Innovation is Information). This is both about government releasing information, as well as creating new opportunities for citizens to provide ideas, concerns, and expertise into public decisions. On that note, there's another expansion to the model that's taking place. The information flows were once largely between small groups in those two circles, country and government: lobbyists, the well-connected, and bigger businesses and NGOs for the former and parliamentarians, communications shops, and top executives for the latter. Now those circles look more like this, with many more information flows between many more nodes throughout the ecosystem. Open government really describes a period of acceleration. It's a term than connects these information flows and expresses a commitment to adding more while strengthening the ones that exist. Not just data and information, but more abstract concepts like context, reliability, rationale, understanding, lived experience, trust, and simplicity. Going both ways and back-and-forth. Which means the question isn't "how do we open government?" but perhaps: "what do we actually need?" "what can we do better?" and "what do we open next?" This post was originally published on the Canadian Public Service Renewal blog.